Responsibly Sourced Gemstones - Leber Jeweler Inc.
Found all over the globe and available in every hue imaginable, colored stones reflect the diversity and complexity of today’s world. The colored gemstones featured as part of our Earthwise Jewelry Collection are not only prized for their broad variety, uniqueness, and versatility, but for maintaining some of the highest sourcing standards in the industry. While we frequently stock many other rare and unusual species, these are some of the gem species we feature in our Earthwise Jewelry® Collection. A precious gemstone that is commonly deep blue, it is available in a myriad of colors including pink, yellow, green, and purple as well as subtle shades of pastels. We source our sapphire from a number of locales, including from Montana sapphire here in the United States and from Malawi, where our business partner and friend has established one of the world’s finest examples of a fair trade gem project. In addition, we work with a close associate on the ground in Sri Lanka. Unlike some of the self-proclaimed “co-ops” that quietly helped fund the armed violence that fueled Sri Lanka’s bloody civil war, our business partner working in this country shares in our belief that peaceful development of gem resources is the best path forward for a nation that has such great promise despite the years of strife. With 90% of the world’s ruby originating from Burma, a country long-ruled by one of the world’s most brutal regimes and in the midst of a difficult transition, this bright red precious gemstone has fueled as much conflict as any blood diamond. Almost two decades ago, we at Leber Jeweler Inc chose to boycott purchasing any rubies from this prolific source in Southeast Asia. Despite the obstacles, we worked with our extensive global contacts in Africa to help develop sources of ruby that did not fund human rights abuses. Simultaneously we worked closely with the US Congress to ban the importation of blood rubies from Burma, testifying before Committee in November 2007 on the importance of this gemstone ban. While the sanctions have been ended, our commitment to human rights has not. We are proud to offer fine quality rubies from carefully selected sources that offer hope to small communities in Africa rather than fueling conflict and violence that still effects many ethnic groups in Burma. A classic green gemstone, emerald remains one of the better known colored gemstones on the market today. Originating primarily from Colombia and Zambia but also from the Swat Valley in Pakistan, since the 1980’s this stone has had a troubled past. At present, despite claims by some sources to be “fair trade”, no source has fully met our high standards and intense levels of scrutiny. We have a limited supply of fine quality gem specimens from our private collection acquired long before many of the contemporary issues emerged. A member of the quartz family and in its finer form a deep purple color. We work with select sources in Brazil. A natural gemstone, our aquamarine originates from a family-owned small mining operation in Brazil. A member of the beryl family, it is named because of its sea blue color. (Latin-“Water of the Sea.”) The aquamarine we offer have helped provide livelihoods for residents of the local community while working to protect the fragile environment of a beautiful country. This golden yellow gem is a member of the quartz family. We work with select sources in Brazil. Commonly a deep reddish brown, garnet is also available in a range of colors from orange to purple, as well as a rare but beautiful deep forest green. This family of gemstone comes from various sources in sub-Saharan Africa as well as from the Czech Republic. The deep forest green variation called tsavorite rivals emerald for the claim of “most beautiful” in this color family. Found only in a tumultuous corner of Southeast Kenya, we work closely with a privately held source that provides for a small group of local licensed miners. While a vast majority of the tsavorite on the market today has been illegally smuggled and has offered zero return to local communities, the gemstones we offer are exported in accordance with Kenyan law after being cut by skilled craftspeople trained in the tradition of the master cutters. A stunning blue violet stone similar in hue to tanzanite, but without the child labor issues that have plagued much of the gem mining in Tanzania over the past decades. The play-of-color of both the white and black opal is a well-known feature of the finer quality Australian origin gem material. While we work with select sources for this classic gemstone, we also offer a unique range of fire opals originating from the state of Oregon. While some pearls form naturally in most varieties of bivalve, over 90% of the pearls on the market today are “cultured”, meaning a small bead was planted in the host animal unto which the nacre formed. They are still a natural product, and while many synthetic pearls exist they should be avoided. The amount of time a pearl is allowed to grow is commensurate with the depth of nacre and as a result, its quality. A fine quality pearl will remain in the oyster for 3 to 4 years, although much of the low grade material originating from China can be measured in months, not years. Our classic white pearls (think “Audrey Hepburn necklace”) are of Japanese origin and originate from saltwater. (Many lower grade pearls are freshwater species from China.) The old story about rubbing a pearl against your teeth to see if it is real is actually true. Natural pearls with feel distinctly gritty against your teeth. The shimmering iridescent natural colors of cultured Cortez Pearls™ are not enhanced in any way. After they are removed from the shell, Cortez Pearls™ are washed in water, soaked in mineral oil for six hours, and then dried. The Spanish admired the pearls they saw local people wearing when they began their conquest of Mexico, near what was then called the “Sea of Pearls” in 1533. Natural pearls were harvested from these waters for the next 300 years, becoming an important export. Unfortunately, the construction of the Hoover Dam depleted nutrients in the Gulf of California, diminishing natural pearl production in the area. To protect the oysters, the government banned harvesting of natural oyster beds in 1939. The Monterrey Technical Institute in Guaymas began studying pearl culturing in 1993, producing the first experimental round pearls in 1996. Only 4,000 pearls are cultured in these waters each year, making them one of the most rare cultured pearls. Only 30 percent of the production is round. Quality of these pearls from the Sea of Cortez varies widely, with the Cortez Pearls™ considered the finest. The citrus green color of this gem is very unique in hue. Referred to as “olivine” by mineralogists, the largest specimen of this gem species weighs 310ct and is part of the collection of the Smithsonian Institution in Washington, DC. The majority of the peridot we offer is single source origin from a private mining operation in Arizona. In antiquity, all yellow and brown gemstones were called “topaz.” However, only one distinct species of gemstones is now properly referred to by this name. (Al2 [Si04][F,OH]2 for you science fans. This species of gemstone, frequently referred to as “precious topaz” is generally a yellow to gold color, but can occasionally be found in pinks and even some blues naturally. It is important to note, you will see “blue topaz” available for sale at many stores and online shops. This gemstone, actually a colorless stone that has been irradiated by exposure to a nuclear pile (think of a nuclear reactor like Chernobyl and you aren’t too far off image-wise.) We have not offered this gem for many years and in the last few years, blue topaz entered the US exhibiting high radioactive levels. So our concerns over the safety of this product were not unfounded. Tourmaline is one of the most visually intense and diversified gemstones around. 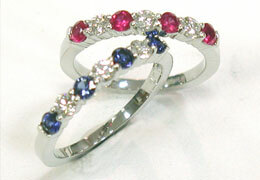 It’s available in an array of hues, and some tourmalines even contain two distinct colors. Rubelite tourmalines showcase the gemstone in its most brilliant and sought-after hues, which range from cranberry to bright red. A recent mining discovery in Nigeria may result in a valuable source of high-quality rubelites. The desert mine of Usakos, Namibia, is the place to find a stunning mint-blue variety of tourmaline. The most highly prized member of the tourmaline family is the Paraiba tourmaline, named for the mine in Brazil that is the only known source for fine specimens of this exquisite neon-blue gemstone. The mine has nearly exhausted its supply of this hue. We work with carefully select sources and have recently acquired material from a small mining project in Cambodia. In addition to the blue zircon, we occasionally have an unusual green zircon in stock.